It has been several years since I've eaten at Taco Bell. Now you know why. In fact, I rarely eat any food that I have not prepared myself. Remember that scene from the Naked Gun? "Every time I eat out"
Seriously he's doing something like that and recording it? I weep for our youth. Glad he was caught, even by his own stupidity, because that's just gross. Are you going to be going to Taco Bell to get some dinner here in a bit Tea? 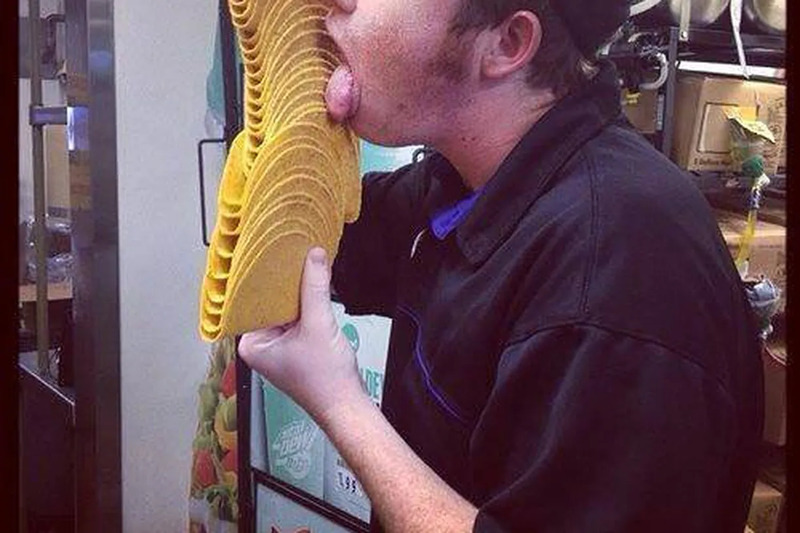 Wow, I haven't gone to Taco Bell in years. Maybe 6 years or so. And no. Jewel your Allergic Hubby may have something to do with that LMMFAO !!!!!!! That didn't even make sense. You're reaching a little too much, may want to reel it in a little. Leftist are stupid Jewel ! Have you not figured out what obvious ????????? That you're stupid? Yeah I figured that out a long time ago, Lefty. Jewel why is your hubby only allergic to service dogs ??????? Has to be a reason behind that ? A few things you should take notes on. A. He's not allergic to service dogs. B. If you really need to you can re-read the debate you are getting this from. C. I know you won't, and even if you do, you probably won't understand it. Jewel you made a post saying your hubby was allergic to service dogs. Why is that ? Bless your heart. Either you don't remember what the debate was about or you just can't read. Why is that? I am trying to understand why a Leftist hubby is allergic to service dogs !!!!! Keep trying. You clearly can't help yourself when it comes to cherry picking and lying. The narrative in your head must be amazing. Jewel you Leftist cannot defend what you say ! That is an inarguable point dummy ! There's nothing to defend against, sweetie. You're creating a narrative in your head that is easily proven false. All it takes is for you to go back and reread the debate and actually understand what you're reading. Jewel you cannot deny you said your hubby was allergic to service dogs ! You wrote it idiot !!!! Jewel you cannot deny you said your hubby was allergic to service dogs ! Sure I can. Reread the debate. Go on, you can do it. I know it will be difficult for you but you got this. Jewel you cannot say that your hubby is not allergic to service dogs ! You wrote it dummy !!!!!!! I'll just go ahead and copy/paste as well. Jewel you are the typical Leftist that wants to back away from what you say ! Reread the debate. Go on, you can do it. I know it will be difficult for you but you got this. Jewel you said what you said so why back up from it ??????????????????????? Jewel you cannot say that your hubby is not allergic to service dogs because you said it. Walking away from what you said is Classic Leftist !!!!!!! And once more for funziez! Do you have a list of the service dogs your hubby is allergic too ? Why is it never hot girls who do stuff like this, then I'd be cool with it. That guy self identifies as a hot girl, so you'll be okay.